Yogi(ni)s of Erlangen!!! Right before the start of the new year, I am delighted to announce that with the start of the new year I will be able to offer a further class to my Erlangen Class Portfolio. This new class is hosted and organized by Yoga21, and will be happening every monday, from 6:30pm – 7:45pm. Yoga21 is a cute little Yoga Space in the heart of Erlangen. Yoga21 is a warm, open, yet private, and calming space, beautifully designed and equipped with everything a Yogi needs. Maxi exclusively offers English classes and it was a no brainer to agree when Maxi offered a space for an English Spiritual Vinyasa in the Yoga21 schedule. Not only am I super excited to teach in English, but I also look forward to dive back deeper into the international yoga community, to meet people from different cultures, hear their stories, and share my experiences of living abroad, on and off the mat. Check out the Yoga21 Website for more infos about the studio, prices, packages and the Yoga21 family. Spiritual Vinyasa is dynamic, creative, playful, inspiring, and soothing. Each Spiritual VInyasa Yoga session invites you to consciously ride the waves of your breath with the intention to reflect upon your self on all levels of your being. Riding the waves of our breath we flow through a mix of playful asana sequences and yin-style slow movements and holds that will allow you to deeply connect with your self and to experience the moment. In the silence of the moment, you can reflect with love, learn about yourself, experience the way your body moves through space, check the reality of your thoughts and emotions, understand the workings of the mind, and let go of any tension that is holding you back to live up to your fullest potential. 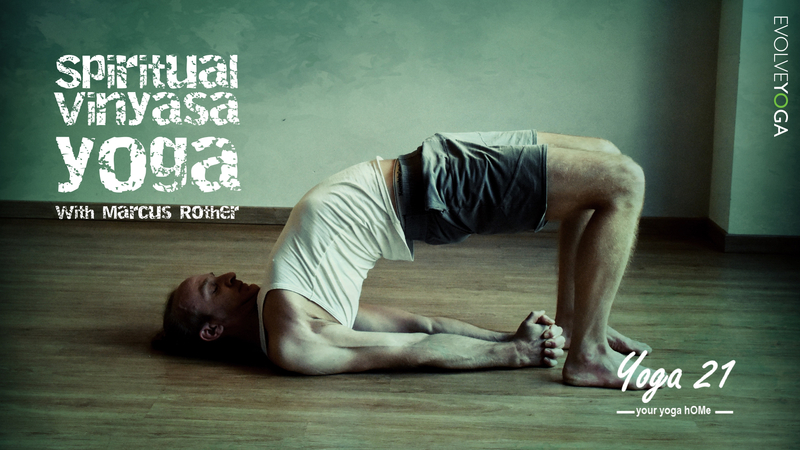 The asana sequences of each session are embedded in a philosophic topic that serves as inspirational tunnel for your thoughts. Inspiring und soothing music playlists invite you to get into your groove of breathing and moving. Spiritual Vinyasa Sessions are for all levels of yogis and yoginis. Marcus always offers several options for each asana so that you can adapt the asana to your body’s flexibility, strength and conditioning. If some asanas don’t work out for you, never mind….there is no goal in yoga…if you practice to meet a goal, then you have missed the point. The universe is generally playful. It has no goal, no direction. It simply exists…. and this is also the invitation of yoga,…to consciously meet yourself and the world surrounding you with an open heart in this moment. Yoga 21 - ErlangenKuttlerstr 21, 91054 ErlangenYOUR YOGA hOMe in ERLANGEN Inspired by a nomadic way of life, the cozy character typical for Yoga21 comes from natural surfaces and earthy tones. Comfy pillows and hand-picked accessories add to the warm, homelike atmosphere. Our team creates a space for your own practice in which to grow and develop. Your very own personal space to slow down.